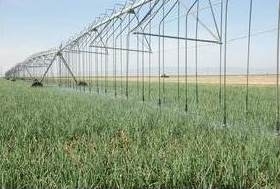 Enhanced irrigation and crop management technologies developed in Five Points, Calif.
Fresh market onions growing under overhead mechanized irrigation in Five Points, CA. The need to produce more food, feed, fiber, and fuel with less water now looms as perhaps the greatest challenge ever faced by farmers worldwide. Our ability to meet this challenge may well determine not only our overall quality of life, but also our very survival in the future. Developing and adopting enhanced irrigation and crop management technologies that achieve greater water-use efficiencies is essential. For the past several years, a team of researchers, farmers, and private sector partners has been working at the University of California West Side Research and Extension Center in Five Points, Calif. to develop enhanced water and crop management systems for a range of crops commonly produced in the central San Joaquin Valley. This work has focused on the coupling of advanced sustainability technologies (such as precision overhead and subsurface drip irrigation systems) with strip-till and no-till planting to achieve cheaper and more sustainable systems. The use of overhead irrigation (sometimes called "mechanized" irrigation) is not new in many parts of the world. 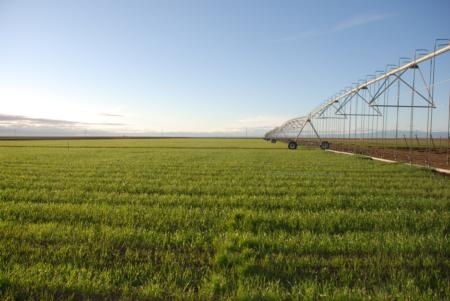 Overhead pivot irrigation is widely used in the Pacific Northwest, the Great Plains, and the southeast U.S. as well as in many other places around the world. 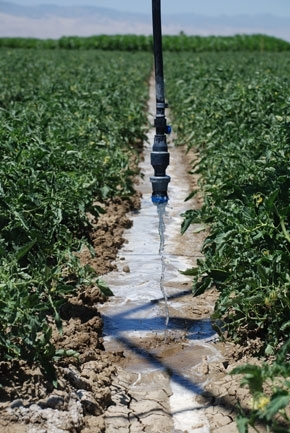 It is the most widely used irrigation system in the U.S. and has been successfully adopted in those regions for decades, but it is not widely used in California. The Five Points research team is working to couple the proven benefits of overhead irrigation, including labor, cost and water savings, with additional benefits derived from preserving high amounts of surface crop residues. "Our goal," says UC Davis researcher Jeff Mitchell, "is to follow in the steps of legendary South Dakota State University researcher Dwayne Beck, and the no-till farmers he works with, to have crops use water more efficiently." Working with colleagues at Valley Irrigation in Omaha, Neb., the California team found that irrigation water application uniformity for the overhead system is 93 percent. This excellent level of application uniformity allows for less water use to meet irrigation demand than systems that are less uniform, such as surface or gravity flow furrow irrigation. In addition, the team showed that 13 percent (4 inches) of soil water evaporation can be saved in the soil during a typical summer season when a thick matte of residues is on the soil surface. This research shows the potential for California farmers to reduce water use and evaporation by combining overhead irrigation and no-till practices. Overhead irrigation systems, such as center pivots, are particularly useful when coupled with conservation tillage. "One of the things that we see with overhead systems and the sprinkler packages that we have attached to them is that they are highly efficient," said Dan Munk, UC Cooperative Extension advisor in Fresno County, on the video. "They are highly efficient systems because they apply water uniformly. If we time this properly with proper irrigation scheduling techniques, we can reduce the amount of water applied." Water, notes Monte Bottens, president of California Ag Solutions, is "the key to everything." "If the water is not there and the water is not right, forget it," Bottens said. West side farmer John Diener goes on to explain in the video that, in addition to delivering water uniformly, overhead irrigation, such as center pivots, gives farmers more flexibility with the land. "All the tillage we did prior to having pivots was done primarily so we could run water from one end of the field to the other and put it on uniformly," Diener said. "With this practice, we have eliminated the need to have such great uniformity on the soil surface and, as such, we can do more non-tillage practices that allow us to store more carbon in the soil." 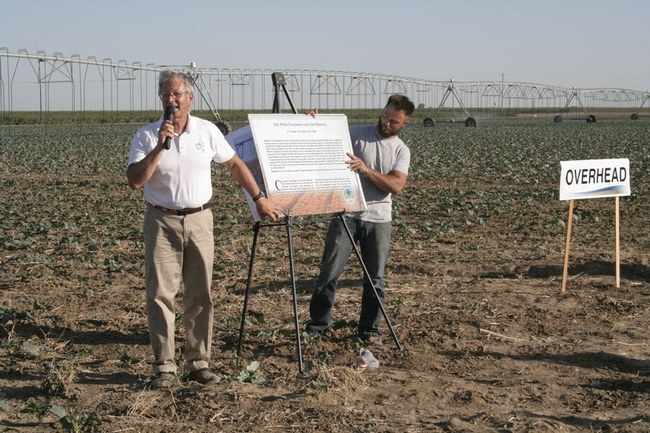 The University of California dedicates its first center pivot irrigation system at the UC West Side Research and Extension Center on Thursday. The dedication is part of the annual Twilight Conservation Agriculture field day, scheduled for 4 p.m. Sept. 13. Farmers and other members of the public are invited to the free event to see the system in operation and learn how overhead irrigation can be combined with no-till or minimum-till farming methods to create a more sustainable, profitable and environmentally sound agriculture industry. The field day includes a free barbecue dinner. For more information, see the field day announcement. To register, go to http://ucanr.edu/TwilightRegistration. UC scientists presented recent additions to the growing body of research on conservation tillage in California at the second annual Twilight Conservation Tillage and Cropping Systems field day Sept. 8, demonstrating progress in agricultural systems that will help farmers cut production costs, reduce soil disturbance and save water. UC scientists and their partner farmers are conducting research that address the current needs of the San Joaquin Valley agricultural industry and research that is looking to the future by anticipating changes that may need to be negotiated in coming decades. During the field day at UC's West Side Research and Extension Center in Five Points, Calif., participants visited two primary research areas. The first is the longest-standing conservation ag system study in California, where a cotton/tomato rotation has been farmed for 12 years running. The plots include standard tillage with and without cover crops and conservation tillage with and without cover crops. For example, scientists have been able to quantify significant improvements in soil quality with the use of cover crops and conservation tillage. UC Davis soil biochemist Will Horwath reported that conservation tillage combined with an off-season cover crop has increased the soil carbon content close to five tons per hectare. Because of the valley’s dry, hot climate, the native soils are typically very low in carbon, which is a characteristic of low soil quality. Carbon in the soil acts as a glue, helping reduce wind erosion. Jeff Mitchell presents research updates on a broccoli field with overhead irrigation. At the second research field, conservation tillage research is being combined with overhead and subsurface drip irrigation. Coupling overhead irrigation with conservation tillage is common in other regions of the U.S., but is just beginning to get attention in California. Overhead irrigation is efficient, automated, allows for diverse cropping and, with soil residues from conservation tillage, permits uniform infiltration. 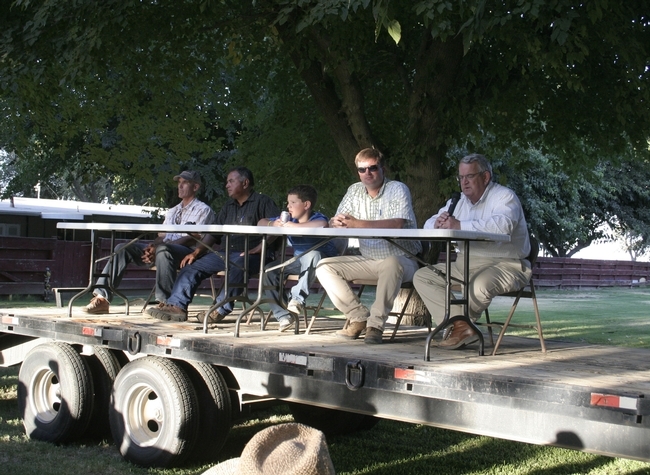 Four users of overhead irrigation shared their experiences with overhead irrigation at the field day. West side farmer John Deiner said mechanized irrigation has significantly reduced labor input in his agronomic crops while boosting crop yields. “Our corn grew two to three feet taller under the pivot,” he said. Will Taylor of King City grows potatoes for In and Out Burger under center pivots. He said his yields are 20 percent higher when using the overhead irrigation system. He demonstrated their ease of use by bringing along his 9-year-old son Liam, whom he said can already manage the machine. Darryl Cordova of Denair uses overhead irrigation in a hilly area on the east side of the valley. “What used to take three guys six hours of moving pipe is now done with a push of a button on my cell phone,” Cordova said. Left to right, Scott Schmidt, Darryl Cordova, Liam Taylor, Will Taylor and John Deiner. Combining low-pressure, overhead sprinklers with conservation tillage may become the new ag production model for the San Joaquin Valley. This combination of practices is quite common in many irrigated regions outside of California but are relatively new here in the Golden State. However, they may soon be much more important for California producers based on information presented at an evening field tour held on June 10 in Five Points. This event was coordinated by the Conservation Tillage and Cropping Systems Workgroup and brought together farmers, leading conservation tillage (CT) researchers, and overhead irrigation industry representatives for the over 100 participants in attendance. “Conservation tillage” is a type of crop management system - such as no-till and strip-till - that leaves crop residues on top of the soil when going from one crop to the next. CT is also a variety of the other “minimum tillage” approaches that reduce the overall number of tillage passes by at least 40 percent of standard tillage systems. UC Davis researchers Karen Klonsky and Will Horwath have been evaluating the performance of CT tomato and cotton rotations at the University’s West Side Research and Extension Center in Five Points for over 10 years. Horwath, a soil scientist, reported that following eight years of CT farming, soil carbon in the top foot of soil increased by about 23 percent relative to the conventional, tillage-intensive system. That very roughly equates to a greater than 40 percent increase in organic matter. This is a significant finding as it is the first such outcome in California coming from a long-term study. Klonsky, an ag economist at Davis, reported that tomato yields were about 9 percent higher in the CT versus standard tillage systems. During the last five years of the study, there have been no yield differences between the tillage systems in the cotton portion of the rotation. There were some establishment problems early on in the experiment that pushed overall cotton yields to 90 percent of those of the standard tillage systems. Fuel use in CT systems was estimated to be 28 percent less than the conventionally-managed systems. These findings are important and quite timely for San Joaquin Valley (SJV) producers but their significance may even be greater when these practices are added to center pivots or lateral move irrigation systems. With mechanized irrigation, tillage that is typically needed to create and maintain planting beds and furrows that enable surface irrigation are theoretically no longer required. This merging of CT and overhead irrigation technologies was the focus of the second half of the June 10 twilight information event. Two overhead irrigation studies are currently underway at the West Side Research and Extension Center. One has compared a wheat/corn rotation under overhead irrigation with a conventional, surface irrigation scheme. UC Davis researcher, Jeff Mitchell, reported using 65 percent less water than furrow irrigation but resulted in similar wheat yields. UC Davis graduate student Brooks Landers also presented information showing higher application uniformities and less deep percolation losses with the overhead system. 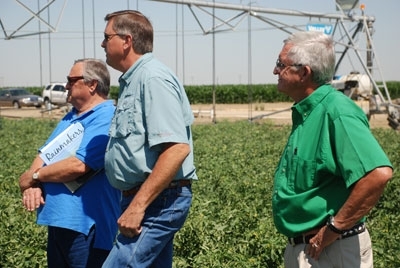 Following a number of presentations by overhead irrigation company representatives, participants visited the farms of John Diener and Scott Schmidt. These farmers have used overhead irrigation for about five years to irrigate wheat, corn, onions, sugar beets, alfalfa, cotton and tomatoes. These two West Side farmers got started with overhead irrigation in 2005 when they traveled to Washington State and to meet with center pivot farmers and overhead irrigation company experts. After meeting with and learning from two Washington farmers who were managing the irrigation of upwards of 8,000 acres all by themselves using automated overhead systems, both Diener and Schmidt returned to their farms and quickly began developing their overhead irrigation management skills. They now use several 135-acre pivots on their farms. Diener pointed out the precision application and automation aspects of overhead irrigation that allow him or his manager to run his systems using cell phone control. Schmidt pointed out the fact that overhead irrigation is different since you tend to be dealing with the top 18 or so inches of soil and thus irrigation timing and frequency must be carefully finessed. For more information on these emerging SJV farming technologies, visit the Conservation Tillage and Cropping Systems Workgroup’s website at http://groups.ucanr.org/ucct/, or call Jeff Mitchell at (559) 303-9689. To become a member of the workgroup and receive periodic updates, e-mail Mitchell at mitchell@uckac.edu. Representatives from CISCO AG, Senninger Irrigation Co and Reinke Irrigation Co at the field day. Discussions have been initiated toward the formation of the California Overhead Irrigation Alliance. The alliance will be a diverse group of farmers, private sector representatives, university and other agency folks interested in developing and extending information on overhead, mechanized irrigation systems here in California. The group will hold a “founders’ meeting” on Friday, Oct. 1, in Five Points. Because of the obvious connections and possible benefits of merging or coupling overhead mechanized irrigation with conservation tillage crop production approaches, it makes good sense for the Conservation Tillage and Cropping Systems Workgroup to be involved with this emerging initiative. "It remains to be seen what form a partnership between the workgroup and the alliance might take, but as options become clearer and more focused, I’ll try to pass on additional information on what is being considered so that we might discuss things together," said Jeff Mitchell, the Conservation Tillage and Cropping Systems Workgroup chair. Several UC scientists are already involved in overhead mechanized irrigation research and extension efforts at the UC West Side Research and Extension Center, but if others are interested in learning more about this overall endeavor or our ongoing work in this arena, please call Mitchell at (559) 303-9689. 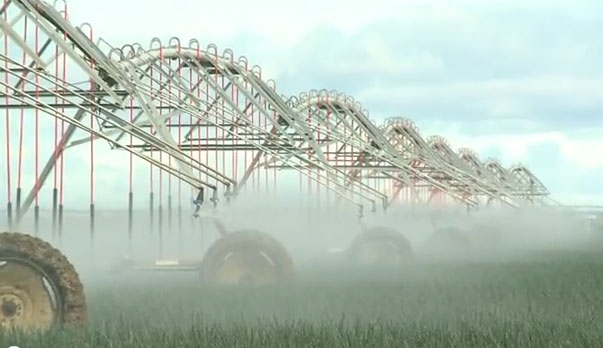 Overhead irrigation can be used in conjunction with conservation tillage.